Guwahati, January 20: PSPB’s Manika Batra and G. Sathiyan regained the Youth Girls and Youth Boys singles crown and the Junior Boys and Girls titles went to Abhishek Yadav and Oishwarya Deb of North Bengal as the 75th Junior and Youth National Table Tennis championships came to a close here at Deshbakt Tarun Ram Phukan Indoor Stadium on Monday. Guwahati, January 19: Brushing aside a few upsets earlier in the day, top seed and PSPB’s Suthirtha Mukherjee, West Bengal’s No. 2 Krittwika Sinha, No. 4 Manika Batra, also of PSPB, and Andhra Pradesh’s Nikhat Banu, seeded sixth, entered the Youth Girls semifinals of the 75th Junior and Youth National Table Tennis championships here at Deshbakt Tarun Ram Phukan Indoor Stadium on Sunday. Guwahati, January 18: After having been witness to a few good matches yesterday in the team semifinals and finals, one had to go through boredom until C.R. Harshavardini from Tamil Nadu bowed out during the qualifying stage in the Junior Girls category of the 75th Junior and Youth National Table Tennis championships here at Deshbakt Tarun Ram Phukan Indoor Stadium on today. Guwahati, January 17: The Petroleum and Sports Promotion Board Academy, led by Abhishek Yadav, thrashed Delhi 3-1 to win the Junior Boys team title while West Bengal conquered North Bengal 3-2 to annex the Junior Girls crown in the 75th Junior and Youth National Table Tennis championships, here at Deshbakt Tarun Ram Phukan Indoor Stadium on Thursday. 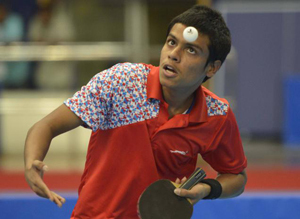 Guwahati, January 16: The Petroleum and Sports Promotion Board Academy (PSPBA) boys drubbed Tamil Nadu 3-0 to enter the Junior Boys semifinals of the 75th Junior and Youth National Table Tennis championships, here at Deshbakt Tarun Ram Phukan Indoor Stadium on Thursday.